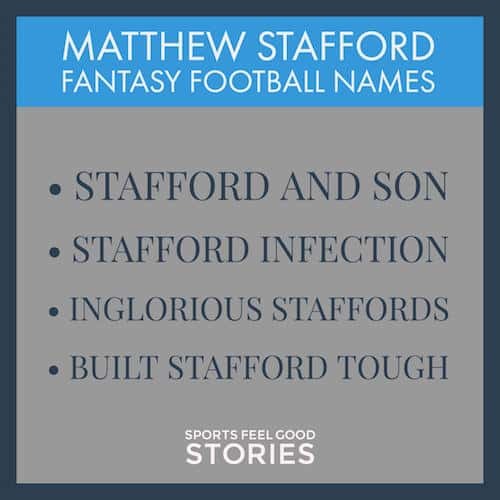 Matthew Stafford Fantasy Football team names place their brand behind the former Georgia Bulldogs QB who has gone on to have more than a few good season with the Detroit Lions. Stafford led his Highland Park, Texas high school team to an undefeated season and a state title. The Lions are owned by Martha Ford, one of the few female owners in the NFL. She took over the helm after her husband William Clay Ford passed away. The Lion’s last championship was in 1957. Let’s just say, it’s been too long. 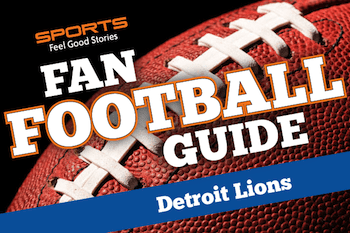 Check out all the Lions’ fantasy football naming options by clicking on helmet. Drafted number one by the Lions in the 2009 draft. One of only four quarterbacks to throw for over 5,000 yards in a single season. He’s the oldest of five siblings. Stafford married Kelly Hall, a cheerleader at the University of Georgia when he played football there. He was the youngest quarterback in the NFL to throw five touchdown passes in a single game. Matt had the most passing attempts in a season with 727 in 2012. He was the first player in NFL history to complete over 60% of his passes in each game in a season – the 2015 season. Stafford was the fastest player to reach 15,000 passing yards. He led the Lions to 8 fourth quarter comebacks in the 2016 season. It ain’t over until Matt says it’s over. Got it? Click on the visual above to learn all about the Detroit Lions and their rich history in the NFL. You’re on Matthew Stafford Fantasy Football Team Names page.